“How’s her overall health?” the dental assistant had asked, after giving rave reviews on my fourteen year old daughter’s teeth. “Well, she exercises fairly regularly and has recently become a pescatarian,” I replied. “A what?” The confusion sent furrows across her already rippled forehead. “A pescatarian. Not quite a vegetarian, because she includes fish in her diet.” I explained. I secretly harbored a delight at the opportunity to say the word out loud. C’mon, say it with me: pescatarian. It’s such a fun word. In fact, I found myself giggling about it over Sunday lunch a few days ago. “It sounds like a religion.” One of my daughters repeated the word with a grin. “I know. The only thing better would be if I could say I was a reformed pescatarian.” I grinned back. I was joining my daughter in this new eating adventure. It was not for ethical reasons. Although I am against cruelty in all forms, I’ve never jumped on any “save the animals” bandwagons. In fact, as I was researching vegetarian and pescatarian diets, I thought it a bit ironic that “pure” vegetarians can get very hateful towards those who use the word vegetarian but (gasp!) include fish in their diet. The very people fighting against cruelty to animals sure can be verbally brutal to fellow humans! This is the reason why around 1993 the neologism pescatarian/pescetarian appeared. It was not for health reasons. I really don’t need to lose weight (though what woman would complain about it?) and am in pretty good health for a forty-something mother of six. And, well, I love bacon. My motivation for choosing a pescatarian lifestyle was, quite simply, love. Love for my daughter. There’s not much else that could persuade this girl to give up bacon, which I’ve always thought deserved its own place on the food pyramid. See, a year of vegetarian eating was on my teenage daughter’s bucket list. She mentioned this to me. The second time, I realized she was serious. She was also sure I would discourage her. Perhaps because as a Christian parent, I find myself using the forbidden n-word. No. There are so many things in the world today that are harmful to young people. While it would be much easier to give in to all of my children’s wants, it certainly wouldn’t be loving. Sometimes I simply have to say no. Other times – especially as they mature – I have to let them make their own decisions even when I disagree. And sometimes I can actually encourage their desires; I can be a cheerleader of sorts. Vegetarian/pescetarian eating was one of those times. And while I knew pescatarian eating was a desire of my daughter, I also knew the temptations would be strong – at least initially – to give up. You know what the Scripture says – two are better than one and a three-fold cord is not easily broken. I prayed that I would be an encouragement as I committed to join her. And sure enough, a few days into our adventure, the family decided to pack a picnic lunch and head to Echo Lake. Fried chicken was the picnic item of choice…and my daughter might have given in to the persuasive pull of that crispy, deep fried skin…except I was there to remind her of our commitment. The temptation passed and she’s been doing great! So have I.
It’s only been ten days, but I am already seeing benefits from my “sacrifice.” I’ve lost a few pounds and my blood pressure is lower than it has been for decades. It’s created a special bond between my teen and me. And I am loving the foods I have been eating. I think the commitment has snapped me out of the eat-whatever-is-handiest funk that I have been in for the last few years. I love beans and soups and salads and grains and fish, but I’m also admittedly lazy when it comes to cooking. (After more than a decade of cooking for an average of nine people a day, I found myself choosing convenience over the healthier, from scratch choices. 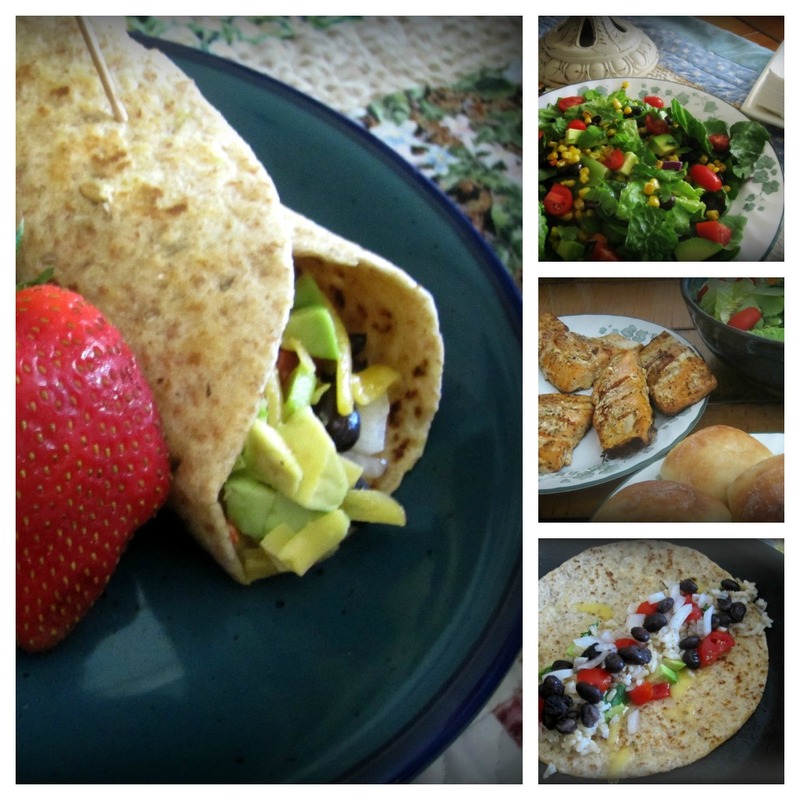 I think this might have happened about the time I started scrapbooking…) It’s certainly not a low-fat way of eating – there has been plenty of butter, and olive oil, and nuts and avocado. And Bryer’s mint chocolate chip ice cream. It’s also not a count-calories way of eating…we eat when we are hungry – no measuring or counting. I can easily see this stretching well beyond a year! Anyway, here are three of my favorite meals from this week: grilled salmon, cilantro/lime rice and beans tortilla, and black bean and pan roasted corn salad. 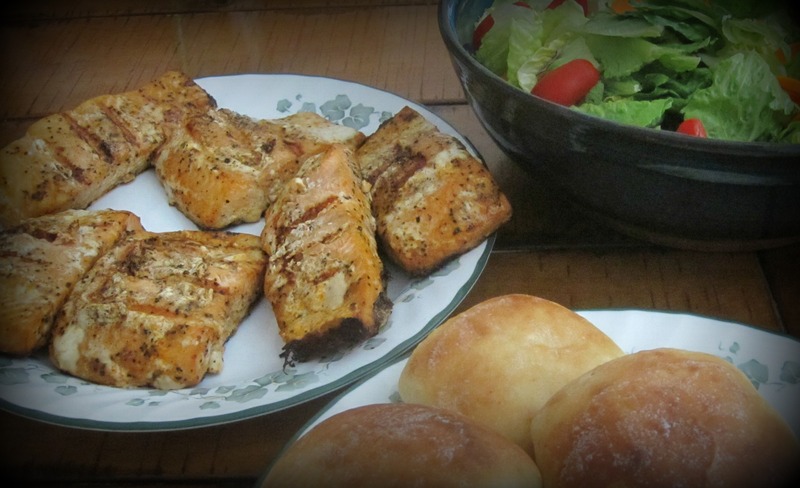 Salmon, oh how I love thee! Cilantro and lime rice and black bean tortilla. Served with fresh strawberries. 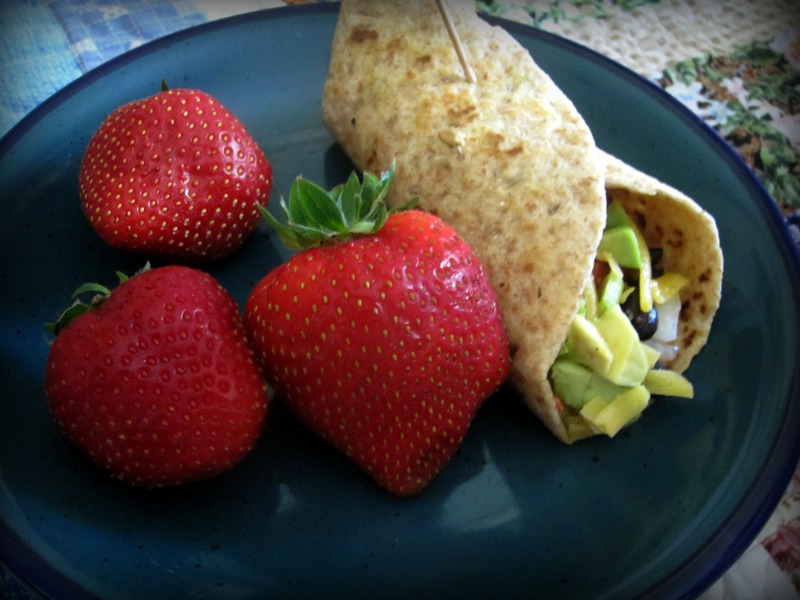 whole grain tortilla filled with all kinds of yumminess: cilantro/lime brown rice, black beans, avocado, onions, cherry tomatoes and extra sharp cheddar cheese. 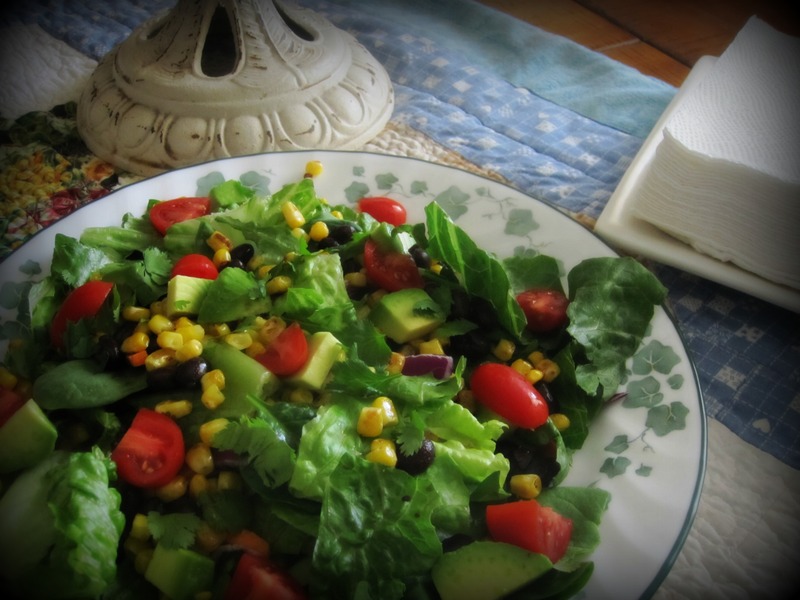 One of my favorite salads: baby spinach and lettuces, pan roasted corn and black beans, cilantro, tomatoes and avocado, topped with a light champagne dressing. My daughter has done a little experimenting on her own. Her new favorite breakfast is cilantro scrambled eggs! We both agree: cilantro makes everything better. I did have one meal disaster this week. Let’s just say it involved Quinoa. Here’s a quote from The Essential Vegetarian that I wholeheartedly embrace: I’m all for the movement to bring back “lost crops,” grateful for the broader selection of legumes, fresh produce, and grains we have as a result. Inevitably, however, we’ll “rediscover” things that are just as well forgotten. I personally include quinoa in that category. AMEN! Been There, Done That – No T-Shirt Needed! Wow. I just stumbled upon your blog about five minutes ago but this post amazes me. 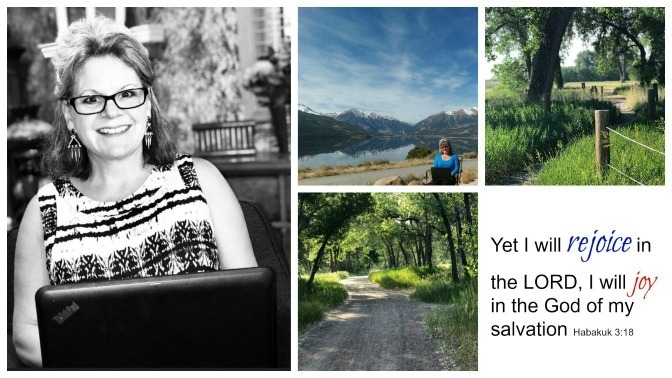 At the end of this post you talk about the sacrifices that you make for your children. I had chills go down my spine when I saw this post was written just one day before the tragic event at the theater when you put yourself in the position to sacrifice your life to save one of your children by covering them. I don’t think that it is any coincidence at all that you spoke about sacrifice and then included that scripture. God bless and I will be praying for your family and all others involved. Officially inspired! Maybe not to be a pescatarian but to join my daughters in things that they desire to do in order to become an encourager…even if it’s not something comfortable or easy. Thanks! First, what an inspiring post you wrote about your experience in the massacre! Thank you for sharing and may God bless you all!!! My eyes dropped down to this post, which I read with much interest. My husband and I watched a documentary called Food, Inc. back around April 2 or 3. It totally change how we feel about eating meat. Absolutely broke our hearts. Hubby was a big meat and potatoes man, but he walked away from beef, pork, and chicken that night, as did I. We believe that God made us stewards over the earth, including animals and we felt to continue eating meat after watching this documentary, we were buying into a system of cruelty, even supporting it. We’re not on a soapbox about it. It was just a personal choice. And we do eat the occasional fish or seafood, so I suppose we’re one that some get angry at, but it doesn’t bother us. Anyway, I think you hit on your post what we were just saying yesterday. We are discovering the beautiful taste of fruits and vegetables…discovering a whole new world of wonderful food. I hope to read more of your blog. You have already inspired me this morning. You are already bringing beauty out of the ashes. Hi! I just found your blog, because of the post after this. It’s all over tumblr, facebook, and just about anywhere else. But I really admire the way you look at Jesus’ sacrifice and are so easily able to apply it to your everyday life. I pray that more of us would wake up every morning, ready sacrifice the way you are, that our hearts would look and Jesus and see that He payed the ultimate price, giving us strength even (maybe especially!) with things that may seem irrelevant from that, like food. I know God is working in you, and has been preparing you so that you may bring Him glory for a long time, not just because of this incident. And God will give you the strength to fight through it! He is in us, so through Him we are more than conquerors! 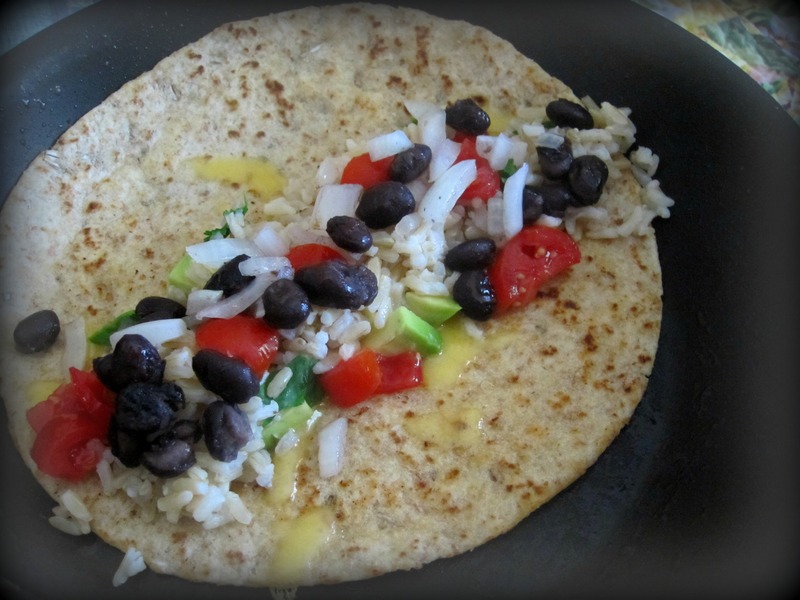 The Cilantro and lime rice and black bean tortilla looks delicious! I will have to try this one. I agree about quinoa 🙂 Tried it a couple weeks ago – not a fan. My name is Julia, I actually came across your blog from our local news, sharing your blog post about being at the theater with your daughters, which I absolutely loved reading by the way. I am so glad I was able to read about your faith, and your knowledge of a loving, protecting, good god. I have the same faith, and it strengthened me to read your words. Thank you! I wish more people could have the understanding that we do, about a loving heavenly father, and thank you for listening to the promptings you were given, so you could have this experience and share it with us all, I am so glad you were all protected, and have a special prayer for everyone else who was involved and affected. It may not be something your ready to try yet, or maybe you will, but I wanted to share it with you just in case. Anyway, I will keep your family in my prayers that your minds will be able to settle, so you can get some much needed rest, and thank you again for your posts! I agree that quinoa has a stronger taste, but I find it good when I cook it with brown rice. Don’t give up on it yet. I found your blog by a referral from the Living on a Dime blog, and I’ve signed up to follow your blog. You post on the shooting was sent to me. You are very good with words. Thank you for the post. I hit the ‘previous’ button and read about being a pecetarian. I loved it as well! My son has gone on a fish and chicken only veg diet. (wonder what that’s called.). Hadn’t thought of doing it with him, but have sort of. Where have you found those delicious looking recipes? I have fallen into cooking as you had and need new ideas. Would you please just shoot me an email with a name or 2 of cookbooks or web pages? No other words are necessary :-). Thanks. Too funny-thanks for sharing this! I too am helping my daughter, and myself, by eating differently: gluten free and dairy free. I haven’t exactly embraced it because I absolutely love bread and cheese, but it has been good for me and very helpful for my daughter. We are discovering new dishes that we love, and eat more fish (absent from our family dinners for the most part up until now). So while we hope to get the bread back someday (good old wheat not millet and flax) we are surviving together. Thank you for your blog about your time in the theater. I appreciated your comment on maybe you are still here to share God with someone…something I often forget to do, we (Christains or other title: those who have been saved) are all still here on earth to share anytime we can. Thank you for using the talent God has given you and sharing through a particularly hard time. Thank you for wonderful posts. We live in Colorado, too, and I still can’t talk about Arvada. Your post about actually experiencing that night was the balm I needed.